where illustration group 15 (shown) exposes this classic, commonly used fake....3 different versions!!! Looking closely you can see that some of the pasted in men in the background don't even have feet. The 'shooter' has different uniform markings, glasses - no glasses in the different versions, etc. A version of this photo is also used by known shyster Michael Shermer. 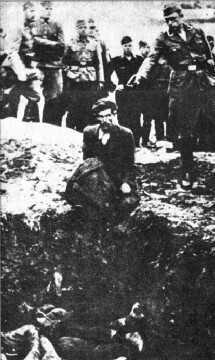 "This photograph of mass executions of Russian Jews by Einsatzgruppen D in the Ukraine, 1942 by itself does not prove the Holocaust. But as one piece of data in a convergence of evidence it helps prove the intentional mass extermination of European Jewry. YIVO Institute for Jewish Research, New York". And notice that the Wiesenthal Center has cropped the feet to hide the fact that the pasted in woman & child aren't even touching the ground. Please be aware you will be arrested in many countries for exposing these fakes. posting the same pic four times in different contrast and quality is hardly prove for fake. What about pasted in 'observers' with no legs is difficult to undertsand? What about glasses in one and not in the other throws you? 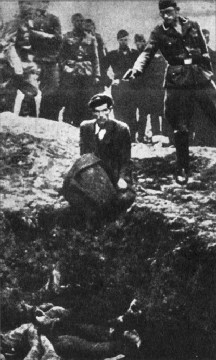 You gotta love the man who was pasted in at the pit edge, sitting peacefully, supposedly waiting to be shot, no resistance, hands not tied. What about the pasted in woman's feet that don't touch the ground is confusing to you? Those sleazy Wiesenthalers hoped we wouldn't see that. What about a shooter who is clearly behind the pastee aiming at something else helps convince you that the photo is genuine? I downloaded a full-size high resolution version of this picture from a rev site. When I opened it up in photoshop and enlarged it to about 300x, you could see that the alterations and touching up of the photo had destroyed the muzzle of the gun, and bent it beyond recognition...Diabolical. 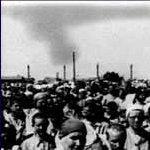 Turpitz wrote: I downloaded a full-size high resolution version of this picture from a rev site. When I opened it up in photoshop and enlarged it to about 300x, you could see that the alterations and touching up of the photo had destroyed the muzzle of the gun, and bent it beyond recognition...Diabolical. 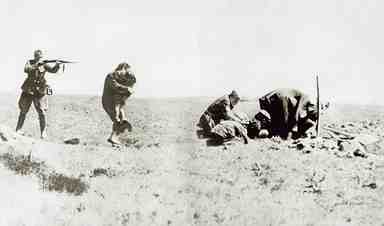 Would you believe that Richard Rhodes in his book on the Einsatzgruppen uses this picture? And he doesn't used it cropped either - he uses it as Mr Hannover has presented it above in the second presentation. 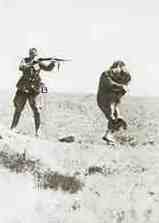 But Rhodes still subtitles it as an Einsatzgruppen soldier 'preparing to shoot a woman and her baby'. Utter tripe. Even when exposed as altering their 'evidence', the Industry just shifts ground like cockroaches hiding in corners. Why do you say the man sitting at the edge is pasted in? You offer no proof that he is pasted in. What else would the nazi be aiming at? Please read the posts in this thread. I have been reading other posts. Since you're an experience poster, why don't you refer me to a thread if you won't bother answering my question? Again, please keep it focused on the man sitting on the edge who you say is pasted in. Why do you dodge all the points made in this thread which you posted to? The man looks absurd; he's neatly holding his coat, his degree of detail is different from his surroundings. Some of the pasted in guys behind him on the left have no lower legs or feet! I'm eagerly awaiting for you to post your best case for 'gas chambers', and the '6,000,000', and the 'state planned genocide' myths....in separate threads of course. Why do you hesitate if you're firm in your beliefs? Let's go, debate us on the specific issues. We all used to be Believers at one time. The detail looks to me the same on the man as on the rest of the characters. The fact he looks "absurd" as you put it doesn't prove a thing. Finally I don't see any legs cut off from the guys on the left. C'mon guys! 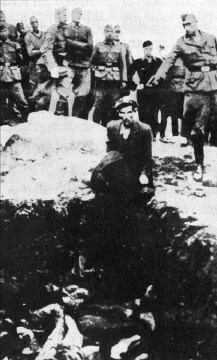 You know the Einsatzgruppen murdered innoncent jews--even Irving admits that...so why won't you fess up to the veracity of this picture? Now if you can show me strong evidence that the Einsatzgruppen didn't recklessly murder hundreds of thousands of jews then we'll get somewhere...point me to a thread, I'll look it up. Ok, believe in this absurd photo montage if you like, I guarantee if you blow it up you'll see missing legs on some the paste jobs. You'll be the only one defending it, but c'est la vie, your choice. So you believe in mass einsatzgruppen shootings do you? No doubt that they executed illegal partisans & saboteurs and there was the occasional atrocity...happens in all wars by all sides, but the standard storyline says 1-2,000,000 Jews were killed in this manner? Can you back that up? Please start a thread and give it a shot. There are threads galore here, search 'einsatzgruppen' and see. Excuse me, but you've been doing a lot of blustering, now it's time to debate the specifics. Do so or please leave. This is getting silly. For David and Hannover: Actually a close examination of the set of 3 Einz. Shooting pictures if overlapped will show significant differences in the positioning especially of the backround soldiers. The question is are these photos from different frames or from an original moving film? If just a single photo then I would say that doctoring has taken place. I am not quite sure but I think that this officer is not quite aiming at the back of the head of the victim or "victim". Now for the shooting photo of the woman holding the child, there is no question that this photo is a montage of the greatest degree. This woman is actually floating in the air (don't forget they didn't have PhotoShop at this time). The shooter, furthermore is most definitely (100 %) aiming at something else in the photo and not the woman. I have contacted Carlos Porter on this one and he has most definitely classified it as a montage fake. I believe I have seen this photo in a fairly recent book entitled This Century where no cropping of the woman's leg is seen. The whole picture in its different variations look absurd. A closer look will show to any average observer that it is a doctored picture. Clearly with the intent of atrocity propaganda in mind. Or do you have a more plausible thesis?! David wrote: C'mon guys! 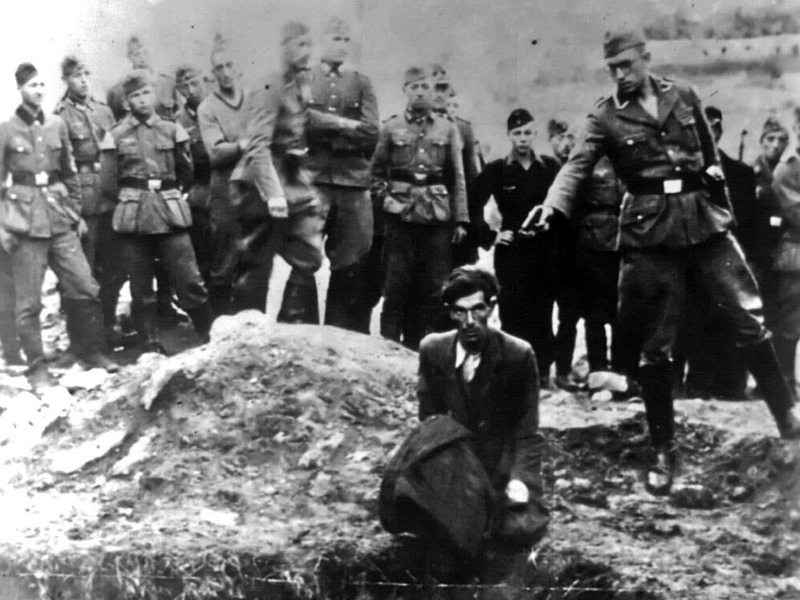 You know the Einsatzgruppen murdered innoncent jews--even Irving admits that...so why won't you fess up to the veracity of this picture? Oh please, the burden of proof would be on you. "Now if you can show me strong evidence that the Einsatzgruppen" DID "recklessly murder hundreds of thousands of jews", then we may have something to talk about. Not in this thread, since it is about faking pictures to promote the Holocaust narrative, not the Einsatzgruppen subject in the broader sense.